1. Add the flour and beer to a large bowl, and season generously. Whisk until smooth. 2. Heat a couple of centimetres of oil in a deep pan. When it’s at the point that it sizzles when you drip a tiny amount of batter into the oil, it’s ready to use. 3. 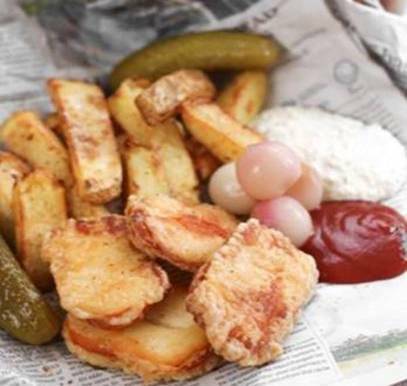 Dip the halloumi slices into the beer batter until thoroughly coated, and carefully drop each piece into the oil. Cook for a few minutes each side, until golden brown. Transfer to a plate lined with kitchen paper for a minute or two to drain off any excess oil, then serve, with more salt and pepper if desired. 1. Top and tail the onions, then peel them whole. Blanch them in a pan of boiling water for about 3 minutes, unit they are just beginning to soften slightly, then drain. 2. In a separate small pan, add the pickling vinegar, caster sugar and salt. Heat very gently for a minute or two, just until the sugar has dissolved – don’t allow the mixture to become very hot. 3. Add the onions to a clean jar, and pour over the vinegar. Add the peppercorns, and if necessary, add more vinegar until the onions are completely covered. Store in the fridge. The pickled onions will be ready to eat a few hours later. Adana is a region in the South East of Turkey famed throughout the country for its kebabs. They are known for being very spicy, making liberal use of biber which is made by grinding dried red peppers grown in the region. Biber can be found in Turkish and Arabic supermarkets – alternatively, dried chilli flakes work almost as well. Sousing is to steep something in vinegar and results in something akin to an unfermented pickle. Recipe serves 4. 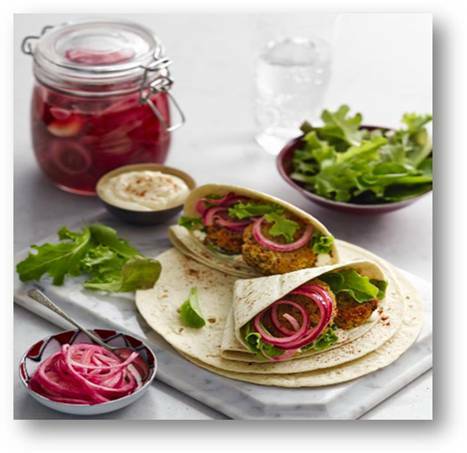 *Sweet and Sour Courgette and Red Onion Pickle – please see separate recipe attached. 1. Heat up 2 teaspoons of olive oil in a large frying pan. Add the chopped onions and cook over a low heat until softened but not coloured. 2. Add the chipotle paste and give it a quick stir. Remove from the heat and spread out on a plate to cool down. 3. Get a large bowl and add the onions along with the pork and beef mince. Use your hands to mix it all together. 4. Divide the mixture into two, wet your hand and shape into two balls then press into 2 burgers. 5. Put the burgers onto a lightly oiled plate, cover with cling film and pop into the fridge for 30 minutes or so. It’s really important to do this or your burgers will fall apart when cooking. 6. When you’re ready to cook; using a piece of kitchen paper, wipe a large frying pan with a little oil. 7. Brush both sides of each burger with a little American yellow mustard. 8. When the frying pan is hot, over a high heat put the burgers in to cook. Leave for about two minutes and then flip them over. Continue to cook the other side for another couple of minutes. 9. The burgers shouldn’t take long to cook so after a minute or so check – medium is best, so try not to overcook. 10. Put a slice of cheese on top of each burger. 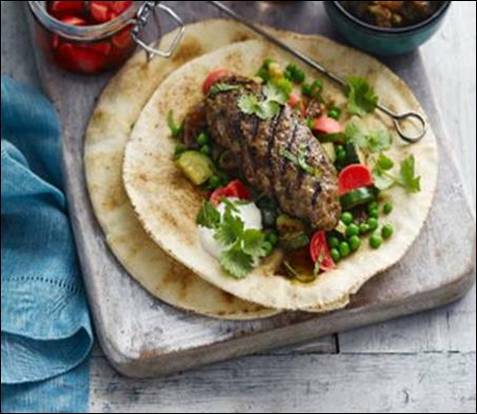 Add a splash of water to the pan and cover the burgers with a heatproof bowl – this will make the cheese melt nicely. 1. Spread half the mayonnaise dressing onto the bottom of each bun. Place a cheese topped burger on top of each, followed by a squirt of mustard. 2. 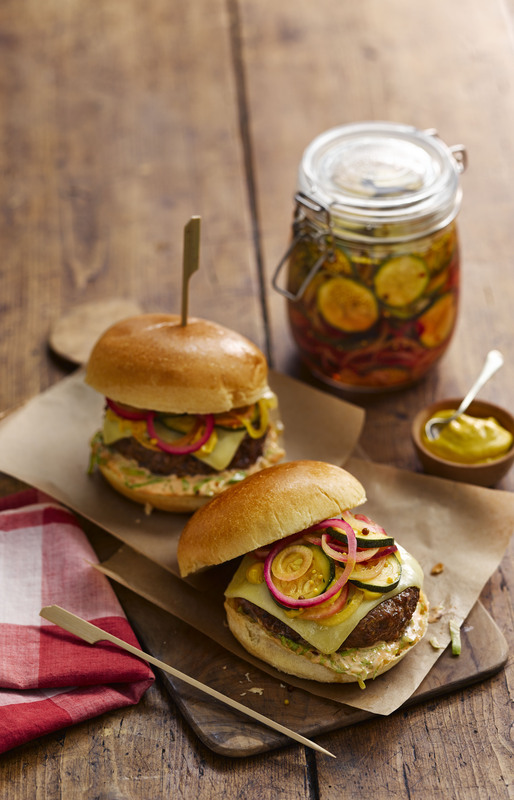 Add sweet and sour courgette and red onion pickle, top with the other half of the bun and enjoy.